United Kingdom - 2017/02/25 - Usman Dildar is a man who has given a lot to Taekwondo. At certain time he was involved in controversy in British Taekwondo, and today he is appointed as Vice-President of the entity. 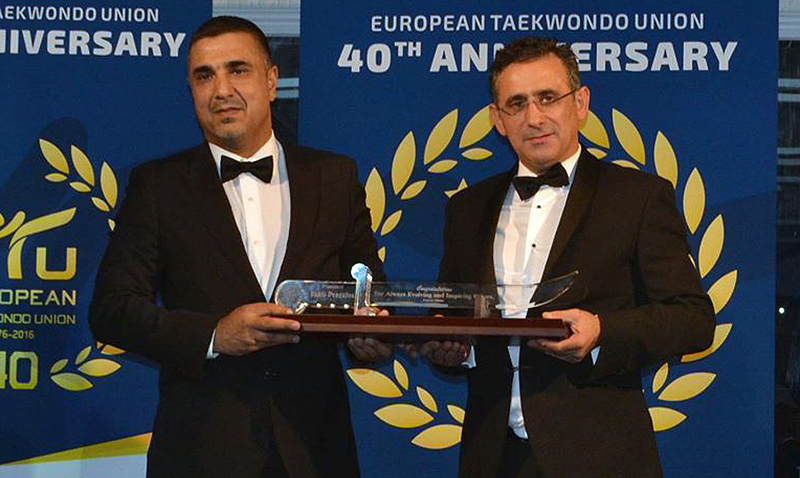 The European Taekwondo Union (ETU) congratulated Usman Dildar on the new position he will play in the British Taekwondo Federation. “Mr Dildar, who is well known within the Taekwondo family for his work for the WTF and ETU and known as well for his involvement in the successful 2012 Olympic Games in London. ETU wishes Mr. Dildar the best luck with his new task”, as it was published this past Monday February 20th. Mr. Dildar will be responsible for all international relations and he will be the new Vice-President of Taekwondo in Great Brittan (GB), as it was expressed in the ETU communication. As by the end of the day, MasTKD monitored GB Taekwondo social networks and web portal, did not publish any information related to its new member. Nevertheless, the Afghan-British published on Facebook the letter emitted by ETU, which confirms its new position in GB Taekwondo. During May 2014 it was published a series of articles which showed that the ETU granted a membership to Scotland to be separated from GB Taekwondo and Usman Dildar supported it. That is, ETU – to some extent with the support of Dildar – technically allowed, having two Scotland before the Council: Scotland that belonged to GB Taekwondo and the new with the provisional membership. The decision was taken without the presence of the United Kingdom in the session room. The diagram of the organization is like this: in the United Kingdom is the GB Taekwondo that conforms by Great Britain and Northern Ireland. Great Britain encompasses England, Wales and Scotland. Then when the separation was allowed and now there are the Scotland of Great Britain and the independent Scotland. The current Vice-President of GB Taekwondo, in May 2014 denounced that GB Taekwondo was vetoing many athletes from Scotland and surrounding countries and used the case of Aaron Cook, who, after giving an Olympic place, and get expatriated. Even Dildar called the British administration “family business” where the President’s wife and son working in the same entity. This controversy created times of tension in ETU, until March 11, 2015 when the continental decided to revoke the membership to Scotland. When this case was made in exclusive by MasTKD, was sounded worldwide, and created denigrating comments – not worth mentioning – against Usman Dildar by members of GB Taekwondo. Usman Dildar is a man who has given a lot to Taekwondo and according to records has always supported the growth of the sport. July 28, 2012 The New York Times mentioned the hope that Dildar sowed in Olympic medalist Rohullah Nikpah. “It definitely goes for a medal. What color? Inshallah – Arabic term to indicate the hope in event -, we are hoping that it is the gold”, as is expressed in the american media. On the site that looks like the official website of the Afghan Taekwondo Federation, thanks Usman for being one of the creators of the organization in 1990, as well as for fighting for WTF recognition in 1993. Without a doubt, Usman Dildar has always fought for the equity, equality and evolution of Taekwondo. So that everyone has the opportunity to practice it. When the Taekwondo refugee program began in 2015; Usman stated in Jordan that “Taekwondo is the perfect sport for refugees because it requires a minimum of equipment and facilities (…) however, it is a demanding exercise, an Olympic sport and a martial art, which provides physical fitness, self-confidence and self-defense”, according to ETU.